Lighter and more powerful, with a high-resolution LCD color display. Spirolab II is the best investment you can make! Testing is easy and accurate, with immediate results. 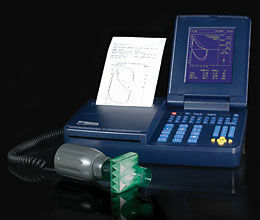 Accurately measures FVC & VC with breathing patterns, real-time curves, pre/post advanced bronchial response with F/V loop comparison.